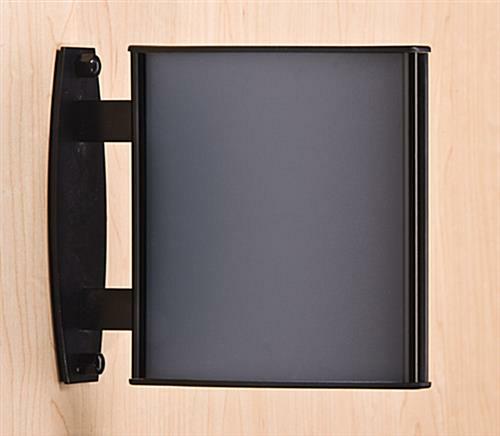 These Interior Signs Holds Portrait or Landscape Style Signage! So Many More Styles, Sizes and Colors Available Online. Choose The Perfect Interior Signs from This Site! 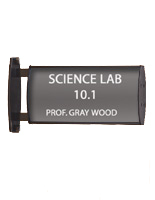 Media Size: 5.75" x 6"
Accommodates (2) 5-3/4" x 6" prints back-to-back, ideal for labeling rooms. Non-glare lens protect the graphic and prevents glare from hindering the view. Mounts perpendicular to wall in portrait orientation, mounts to ceiling in landscape format. These interior signs are great for displaying important information to customers. The display is two-sided, designed to fit (2) 5-3/4" x 6" prints. Graphics can be showcased back-to-back, making these interior signs that are dual-sided able to be view by visitors from both directions. The wall frame is an effective way to display signage to visitors and guests. These interior signs that have a curved shape are sure to get attention. The flag-design of the unit ensures those passing the signage will see it. These interior signs that have a universal design can be used in any business setting for displaying any simple and straightforward information. 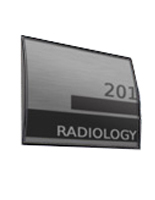 The office wall displays seen here are made from high-quality aluminum to last long. 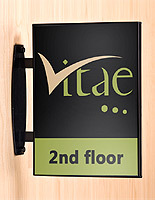 These signage systems, interior signs that have a sleek black finish can be easily mounted to most flat surfaces. Private companies would find this wall frame useful for showing department name or occupant titles. These wall-mount interior signs, like ADA notices, can also be used to show restroom locations in public areas. 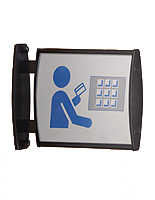 The display is an ideal way to communicate simple messages like room numbers, direction arrows or warning symbols. These interior signs, also known as signage systems, do not come with printed graphics. To save more time and money, customers can custom made their own signage and print it using a regular printer. 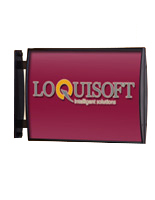 This particular unit also comes with a non-glare lens included to ensure the signage can be readable from all angles. These office wall displays, interior signs also allow fast and easy graphic changes! 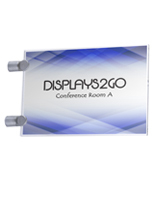 Unlike other sign systems, this product does not require any hardware to change-out the prints. 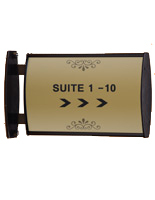 The artwork can be changed directly from the front of the office interior signs by using the suction cup provided. Besides, users also do not need to remove the unit from the surface. These wall displays are sold in other sizes as well. 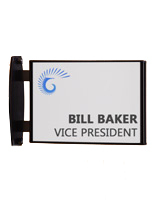 Buy this office sign at an affordable price and use it to direct visitors, guests and new employees!